Well I must say that Piglet is a smart guy! A fellow stitcher shared this on Facebook this week. I did have one finish this week. Stacy Nash Primitives Halloween Pin Keep. I am not sure how I will finish this one up. I may mull it over for a while. I thought you all might enjoy this picture my brother in law, Bruce, posted this evening. Riding on the John Deere, taking in the scenery. This is why Bruce loves farming. The piece came out well. I finally made some decisions on the ones I had on my table the other day. That scene is beautiful. 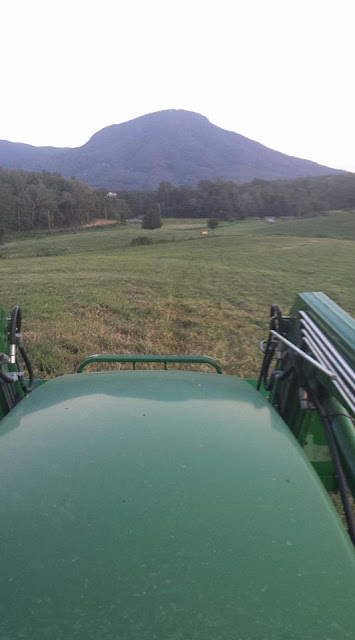 Riding the tractor becomes therapeutic with those scenes. Looking forward to seeing how you finish the Halloween stitch, it's very cute. I think Farming must be a very rewarding vocation. Nice photo! Bruce captured a good scene! Love your stitching projects, Arlene! Pooh and Piglet have it all figured out!! I like the scenery from Bruce! What a pretty design. I remember it was hard to stitch with dark colors. You are SO good! Enjoy your day! Hugs!